Google Now can do a lot of things, and provide you with a lot of different information, including sports scores, weather, news, event notifications, nearby places, stock quotes, traffic info, flight times, movie showtimes, and even info about live TV. 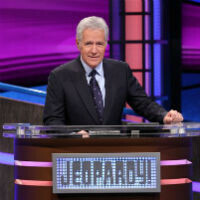 That last bit has just gotten a pretty cool update, specifically concerning Jeopardy. 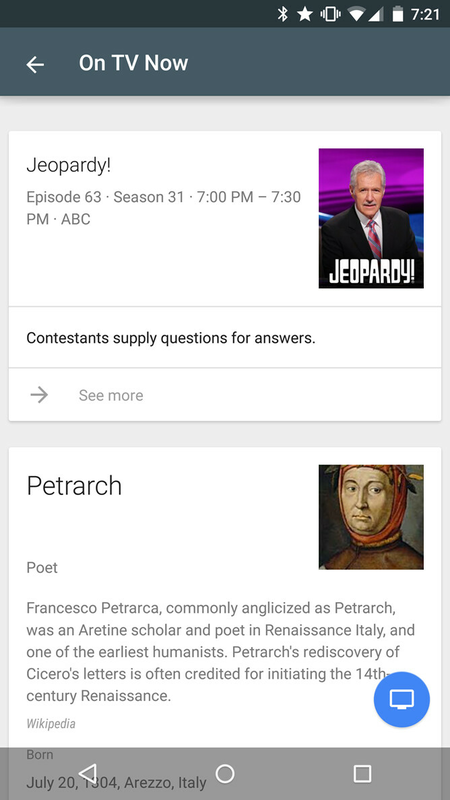 The details aren't fully known yet, because only a couple people have reported seeing the new card, but it looks like Google Now is offering a new card that provides extra info on Jeopardy questions as they are answered in real-time (or Jeopardy answers as they are questioned, per the rules of the game). It seems that Google gives context to the answers/questions, but obviously does so after the question/answer has been provided, so as to not spoil the game for you. This is pretty impressive, especially given how quickly the game moves, with a maximum of 61 questions in a short 22 minutes (not counting commercials). Of course, given how quickly the game moves, we're not sure how useful the cards will be, because you'll miss the next question as you're reading about the last. The other part that isn't so clear is with how Google knows when to push this information. Usually, when it comes to serving info on live TV (or rather first-run TV, which may not be live), you need to have a web-connected TV, Google TV, or Android TV on the same Wi-Fi network as your Android device, so Google can sync info with what is on. This is important, because shows run at different times in different regions. Unfortunately, the redditors who are reporting seeing these cards aren't explaining fully the circumstances around the cards. Anyone else seeing these cards? miles ahead of siri and cortana....gnow is the knowledge vault !